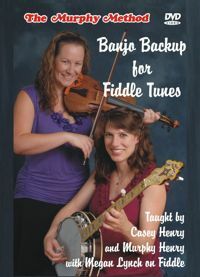 Playing backup to a fiddle is one of the “funnest” things a banjo player can do! No pressure—you just hang around in the background doing simple roll patterns. But what rolls do you use? Casey and Murphy tell you (and show you) all about it in this DVD. Did you know you could back up "Sally Goodwin" with just two licks? Sure you can! Of course, you can make it harder and they show you that, too. With these newly acquired skills--plus a few other licks--you are ready to back up "Turkey in the Straw", "Old Joe Clark", and "Leather Britches".